Perfect for a tropical escape and fuelled with lavish décor, Samabe Bali stands out for its beachfront facility. Accentuated with scenic beauty and secluded location, this hotel is canopied with luxurious rooms, panoramic oceanic view, private pools and palatial bathrooms. Surrounded with tropical rainforest and white sandy beaches at its doorstep, Samabe is a perfect Bali getaway for a relaxing vacation. Created for your impeccable taste, Rempah offers a variety of cuisines for all your gastronomical cravings. Overlooking the cliffside of Nusa Dua, with top-notch setting and distinguished with fine cuisine, tantalize your taste buds with a spectacular view at the height of the cliff. Accentuated with an exotic blend of stone and timber, lush greenery as backdrop along with the display of various spices, create a beautiful sensation as you dine. Comprising of three elements, TE – traditional tea, JA – a traditional Indonesian herbal drink – ‘jamu’ and CO – coffee, this lounge blends Balinese origins with modern aesthetics, accompanied with a wide variety of Indonesian snacks. Unwind with imported beers and signature tropical cocktails along the endless vista of the Indian Ocean. Go early to catch good seats as the capacity of this pool bar is upto 21 seats. Book a session in advance as the spa is usually in high demand. Take a break as you relax by the pool or enjoy a cool dip. Fresh juices and light snacks are available by the pool, if you wish to lounge on the daybeds and catch some sun with a view of the deep Indian Ocean. Don't forget to pack your swimwear and a pair of sunglasses as well. Take your sacred vows inside the pristine Samabe Pearl Chapel, surrounded by astounding ocean views and majestic high mountains. Constructed wholly with glass, you can behold the limitless natural beauty. From decorations to catering and hospitality of guests, hotel staff takes care of it all, plus the couple gets complimentary one-night stay at One Bedroom Ocean Pool Villa. Extra bed is available on request with surcharges. Additionally, Samabe provides free cribs. Children are welcome, but pets and service animals are not allowed. Children below 3 years of age stay free while using a cot/crib. 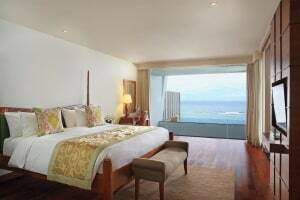 Children from 4 to 11 years of age can use an extra bed for IDR 797,500 per child, per night. 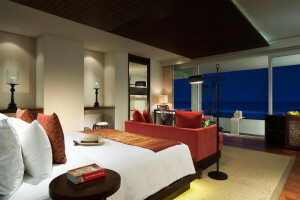 Guests from 12 years and above can use extra bed for IDR 1,595,000 per person.